All Thumbs Reviews: You. On seven square inches. You. On seven square inches. In my pre-mom life, I held quite a few jobs at quite a few organizations. Always, my employer supplied me with business cards. If I were to dig through the cellar, I would find a dozen different boxes of cards -- each with my name on them but with varying titles, color schemes, and company names. I don't have an employer now, unless you count Tessa and Reed, who demand more of me than any boss ever did. And less politely, too, I might add. Such a sense of entitlement from those little tyrants -- three meals a day they expect! And bike helmets and bedtimes and band-aids and boundaries! 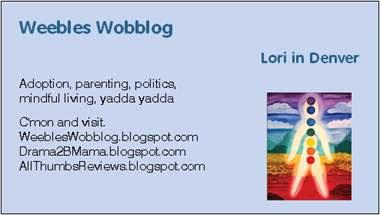 I wanted to have something to hand out when I attend and speak at the BlogHer conference next month, so I set out to design and order my own business cards. By coincidence, my husband recently received a flier for business cards that came with his Amazon order. I took the flier and headed to the VistaPrint website. I was not impressed at first because I couldn't even get onto the site. I called the 800 number and was told that their website was inaccessible by IE 7 and Firefox -- my laptop's two browsers. Luckily, my desktop has IE 6. After that bump, though, the process was easy-peasy. I chose my color (note to VistaPrint: offer lavender). I chose my font. I chose my text, and I uploaded my own image (for a fee). I chose glossy over matte finish (for a fee). I chose not to have anything printed on the back. These cards were CHEAP! Including shipping and handling and optional fees, I got 250 for about $19. It seems that VistaPrint's business strategy is to upsell and to cross-sell, for during my checkout I was bombarded with other offers, which were easy enough to skip. But what about the product? My cards arrived this week. I love them. I LOVE THEM. Thumbs up for VistaPrint. So in case YOU would like cards for your blogging self, your entrepreneurial self, or your mom self (wouldn't it be great to hand out a card to other moms you meet with your vital stats on it -- name, email, neighborhood, and kids' ages -- instead of rummaging in your purse for a scrap and a pen?) VistaPrint just gave me a super-secret code (shhhh -- don't share with anyone except your 100 closest friends) that will allow YOU to design cards for super low prices. Click here to create your own cheap but classy business cards -- or other stationery goods. If you get a set for yourself, make a post about it and show your new card. Leave a link here so we can all oooh and ahhh like it's the 4th of July. * which now appears to be resolved. Very cool. I don't know if I could get past the initial frustrations though, I mighta gone elsewhere cuz I'm impatient like that. Deathstar -- yup! The box my cards came in says they ship to 120 countries, and Canada is one of them.